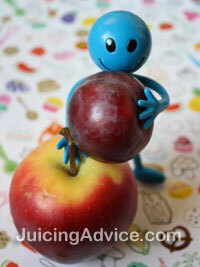 Is your child eating the fruits and vegetables he or she needs to grow up healthy? No matter how many times they are put into lunch boxes or on the dinner plate, children more often than not may pass on eating them whether they are raw or cooked. Juicing for kids can be a great solution to this problem. This is why more parents may want to consider giving fresh fruit and vegetable juices to their children. Not only do children enjoy the taste, but the enzymes contained in fresh juices allow the body to put all the vitamins and minerals to use. First, start with one type of juice given in a small amount. For example start with an apple or orange, and test with half fruit juice mixed with half water. Children also may like pears or grapes, but because grapes are much sweeter, dilute with more water. Encourage your child to understand that fruits and vegetables are healthy. Set a good example for your child by preparing and drinking juices regularly for yourself. And let the child be involved in the juicing process. Let the child choose when shopping for fruit, and let the child help clean and prepare the juice. Children are more likely to drink if they are involved in the process. 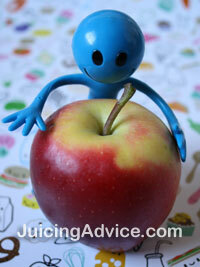 Here are some children’s juicing recipes. 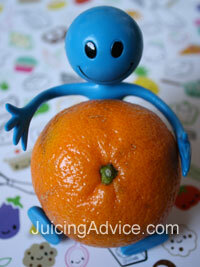 There are some tips to consider when giving fresh fruit and vegetable juices to children. Consider a child’s age when deciding whether to give a child fresh fruit or vegetable juices as a child’s stomach may be sensitive. When introducing fresh juice to a child under 12 years old, first dilute the juice with water. This may prevent stomach upset when they first try them. Do not give juices to children close to meal times as the juice may fill them up and prevent them from eating their meal. The best time to give juice is in the morning during breakfast when the complex carbohydrates will give them energy. Numerous studies show there is no connection between consuming fruit and vegetable juices and being overweight. Juicing for kids using whole fruits and vegetables are beneficial to consume needed fiber, but children can also obtain needed vitamins such as Vitamin A, Vitamin C, potassium and other nutrients in fresh juices. Find out about more juicing health benefits. Remember that fresh fruit and vegetable juices can become part of healthy balanced meals for children. Encouraging good eating habits now will develop into lifelong healthy eating habits as adults and juicing for kids is a great way to get started.